The all-important February CPI report showed both headline and core inflation fell. That partially explains why stocks and Treasuries have rallied this year. Treasury yields have embedded inflation expectations. Slowing economic growth and inflation have pushed them lower. Stocks like the dovish Fed which has been able to pause hikes because of the decline in inflation. Headline monthly inflation was 0.2% which was above last month’s reading of 0% and met the consensus. As you can see from the chart below, yearly headline CPI was 1.5% which fell from 1.6% and met the consensus. Core CPI determines Fed policy. Monthly core inflation was 0.1% which missed the consensus and last month’s reading of 0.2%. That was a relatively big miss since it rarely misses estimates and the unrounded inflation rate was 0.11047%. 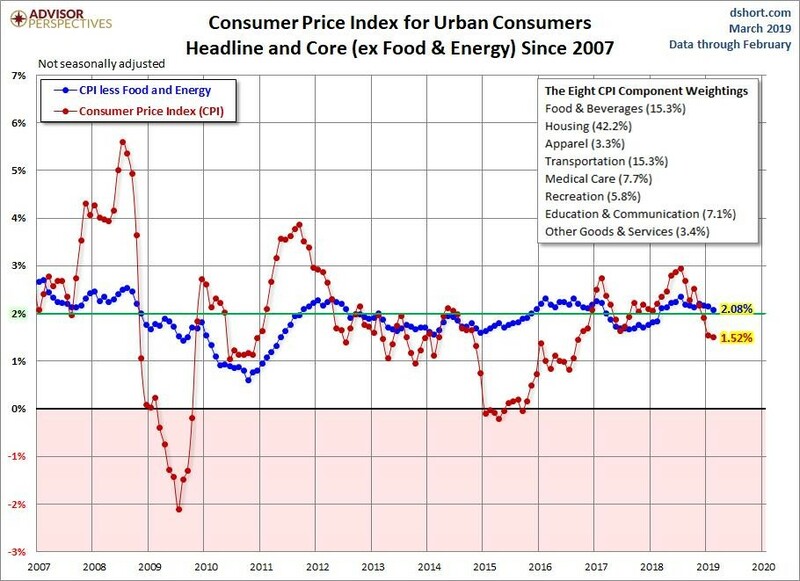 This was the case with yearly core CPI. As you can see from the chart below, yearly core CPI was 2.1% which missed the consensus and last month’s reading of 2.2%. The unrounded reading was 2.08361% which was the lowest since February 2018. It’s interesting how close yearly core CPI has stayed to the Fed’s 2% target. Not including volatile food and energy prices makes it easier for the rate to stay consistent. If you believe core CPI is a good metric of inflation, then the Fed has done an amazing job of keeping inflation near its target. Lately, other developed economies have had a tough time getting inflation to increase enough to reach their targets. The chart below has an arrow pointing towards the big boost in core inflation last March 2018. It went from 1.83% to 2.1%. That tough comparison means core inflation will likely fall below 2% in the next reading. That will support the Fed’s patience. To be clear, patience means the Fed won’t hike rates this year. The Fed funds futures market shows there is a 79.2% chance the Fed doesn’t change rates this year and a 20.8% chance it cuts rates at least once. The Fed will update its guidance for the first time since the December meeting at its meeting on March 20th.